The IIS Auditorium seats 400 guests to watch our brilliant students perform with all of their hearts. School productions include student dramatic and musical performance, graduations, student honoring, and student or parents workshops. 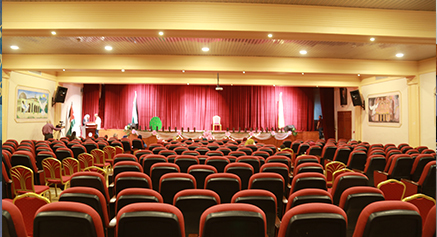 The auditorium is exceptional with its design and structure, ideal for in-school performances and uses or for external use from the community. The stage is capable to cope with large-scale performances, uses modern lighting systems, wireless digital sound systems and data show screens. Depending on the occasion, backdrops are designed in the school and installed. The arts has its place in IIS and rooms are very well catered for students to engage in their talents. 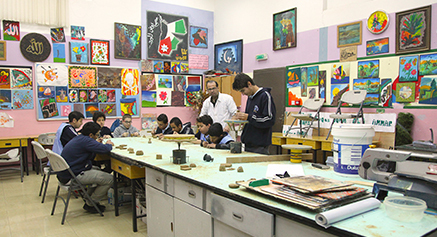 Three art and vocational rooms are spacious to accommodate full classes to work together or individually in projects. Additional resources include shelving and any other storage areas for student work, art resource materials, sinks, hand tools, computers and printers. The Music room, one of the student’s favorite rooms, is equipped with instruments, music software and hardware for students to experiment and explore. Instruments include but are not limited to keyboards, guitars and drums. The room is also used to record student’s singing and dramatic performances as backdrops in performances. 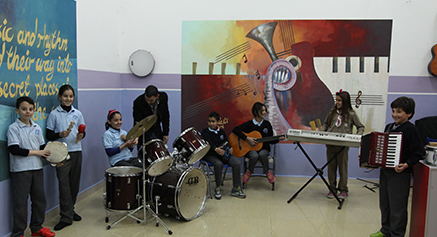 It is accessible during their music classes or during the breaks and after school to allow students to strengthen and explore their talents.